The second Ronson album, Play Don't Worry (RCA APL 1-0681), recently released, is far better than last year's debut Slaughter on Tenth Avenue. The first album was excellent in parts, but Ronson seemed unsure of himself. The result was the inclusion of weak material and poor mixing of the vocals. Play, on the other hand, is a more assured and independent effort. 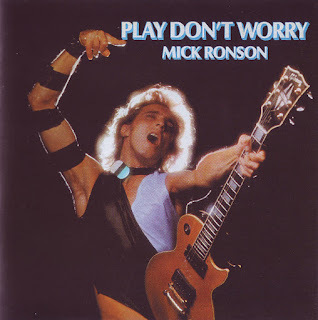 Ronson had a hand in writing only four of the album's songs, but he is credited with all guitar and most vocal work and he tries his hand at bass, synthesizer, keyboards and drums. He handles all the material as wholeheartedly as if it were his own, In contrast to Slaughter, the production and mixing on the new album is almost faultless. Only on one occasion, a rendition of 'The Girl Can't Help It,' are the vocals lost in the mix. The printing of Ronson's pleasantly unsophisticated lyrics emphasizes their awkwardness, but they sound much better than they read. Ronson's live role with the Spiders was that of lead guitarist, his tonal expertise combined with sheer volume produced some wonderfully frenetic guitar work. For the most part his playing is more subdued on his own records, but at times he releases all inhibition. His guitar wails through 'Angel No. 9' and he recalls his live work with 'White Light/White Heat.' Fast-fingered bassist Trevor Bolder and pianist Mike Garson recreate their Spider roles. Overzealous drummer Aynsley Dunbar sometimes borders on sloppiness, but adequate percussion work is supplied throughout the album by Paul Francis, Richie Dharma and Tony Newman. The original version of 'The Empty Bed,' 'Io Me Ne Andrei' was done by Italian crooner Claudio Baglioni. Ronson's English lyrics are not a literal translation, but the ultra-romantic sentiments are left intact. An Italian music/English lyric fusion, 'Music is Lethal,' was attempted on Slaughter on Tenth Avenue but it failed because the involved lyrics wee unsuited to the frail melody. 'The Empty Bed,' on the other hand, works perfectly. 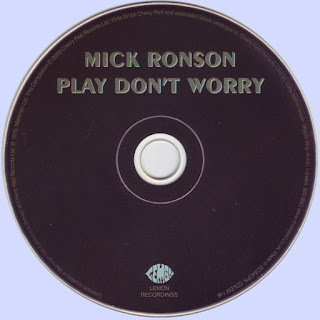 Ronson has become an assured vocalist, signing in his best saccharine tinged voice. His vocal proficiency allows him to handle the hard and the soft with equal finesse. Angel #9 is a masterpiece.